Batteries are such ever-present items that we hardly give them a thought, other than to complain when we discover we don’t have a replacement handy. But if you stop to think about it, they’re a technological marvel: energy stored in a compact, portable form. And technology has taken full advantage. If you’ve taken a call or snapped a photo on your cell phone, made notes at a meeting on your laptop, glanced at your wristwatch, used a remote control to open your garage door or turn on your TV—all normal activities for most of us—then you’ve been depending on various types of batteries to get you through your day. But how much do you know about all those batteries powering your devices? Should you be keeping your spare batteries in the fridge? The freezer? How about the first time you use a rechargeable battery—should it be charged for 24 hours first? And what about disposal? Can you just toss those dead D-cells from your flashlight into the trash? This fact sheet will look at the various types of batteries and how to get the maximum use out of them. And since there’s no such thing as a free lunch, we’ll also look at the environmental cost of all that portable convenience. Batteries contain heavy metals such as cadmium, lead, and nickel that—if carelessly disposed of by burying or burning—can leach into ground water or disperse into the air. Fortunately, it’s now easier than ever before to dispose of worn out batteries in a safe and environmentally responsible fashion. Let’s start by looking at how batteries work. As a result of chemical reactions within the battery, there is a build-up of electrons at the negative electrode, leading to an electrical difference between the negative and positive electrodes. When the circuit is closed—i.e., a connection is made between the negative and positive electrodes—electric current flows. 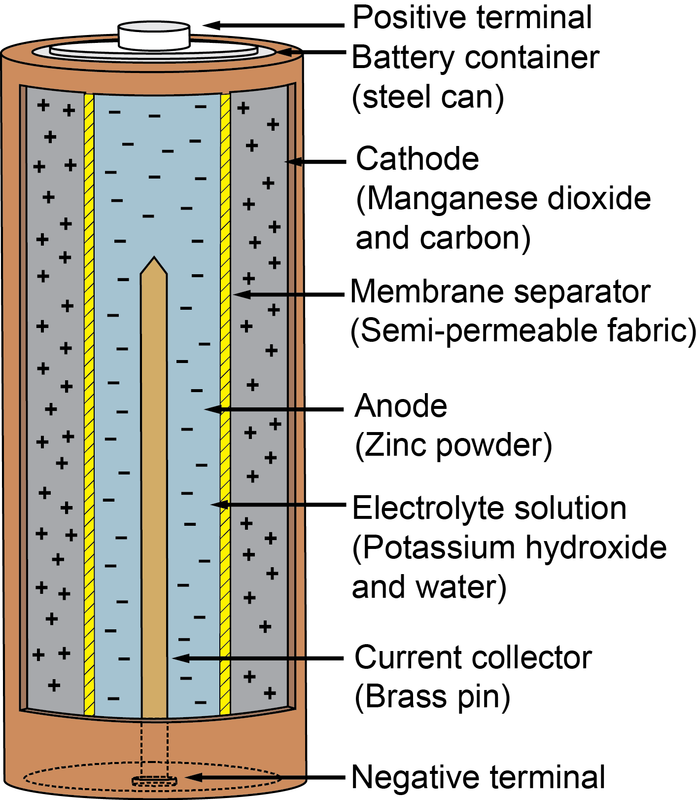 The composition of the electrodes and electrolyte varies, depending on the type of battery. Electrolytes can be in the form of a liquid (a wet cell battery) or a paste, containing only enough water to allow current to flow (a dry cell battery). Historically, wet cell batteries were the first to be developed, but have mostly been replaced in everyday use by dry cell batteries, which can be operated in any position without the worry of spilling or leaks. Wet cell batteries are, however, commonly used in cars, motorcycles, and boats. You probably know that batteries come in two basic forms: single-use or primary batteries, which are discarded once they run down, and rechargeable or secondary batteries, which can be reused many times. Each type has advantages and disadvantages. Single-use batteries are meant to be used once and discarded. They can produce current immediately, without being charged; and they hold their charge well over time. They can’t be recharged because the reactions that produce the current alter the chemical components so they cannot be reversed to their original state by electrical means. They are best utilized in situations with intermittent or low power use, such as remote controls, alarm clocks or smoke detectors. Primary batteries are produced in greater quantities than rechargeables, and thus are cheaper per unit to purchase. They’re widely available and easy to find. But they’re also wasteful, since they can’t be recharged once they run down; and as a corollary, extras have to be kept on hand (so that you’re not left in the dark when your flashlight “burns out,” for example). The EPA reports that on average, each person in the United States discards eight batteries per year. That’s a lot of batteries: Americans throw out almost 180,000 tons annually , with a majority of these being the single-use variety. But it’s getting easier to recycle them. Many communities have household hazardous waste collection sites that accept single-use batteries. 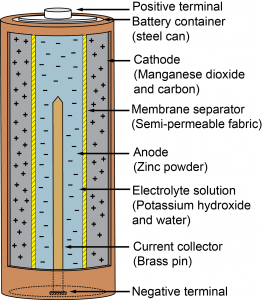 This type of battery is composed of a zinc can, which serves both as a container and negative terminal. The positive terminal is generally a carbon rod surrounded by a mixture of manganese dioxide and carbon powder. The electrolyte is a paste composed of zinc chloride and ammonium chloride. These are the batteries labeled “General Purpose”, and are the cheapest to make; they’re frequently found in devices that come from the manufacturer with batteries included. They’re available in a range of popular sizes (9 volt, AA, AAA, C, D), and are used to power a wide variety of devices, including toys, remote controls, flashlights, clocks, and radios. Zinc-carbon batteries can leak when they age, although improved manufacturing methods and materials have reduced this problem. Leakage occurs because the zinc “can” is not only the container, it is one of the electrodes, and is gradually consumed as the battery produces current, making the walls of the battery thinner. Furthermore, the electrolyte paste is acidic, and eats away at the zinc even when the battery is not in use. For this reason, manufacturers recommend removing such batteries from devices if they are not going to be used for long periods of time. Alkaline batteries are so called because the electrolyte used in them is the alkali potassium hydroxide, rather than the acidic chlorides used in zinc chloride batteries. Alkaline batteries have greater power density and a longer shelf-life than zinc chloride batteries. They come in the same array of sizes, and are used in the same devices. Some alkaline batteries are designed to be rechargeable, but most are not. Don’t attempt to recharge them unless the manufacturer specifically indicates they are rechargeable, and make sure the recharger is designed for alkaline batteries. Silver oxide batteries have a long life and a very high energy/weight ratio, but because silver is expensive, their use is generally limited to “button” or “coin” batteries—such as those used in watches, hearing aids and calculators—where the price of silver is not a significant cost in manufacturing. These batteries depend on reactions between zinc in the battery and oxygen in the air. And because air is one of the reactants, there is more room in the battery for zinc (compared, for example, to a zinc-carbon battery that must also have room for manganese dioxide). The result is a battery with a high power to weight ratio and is comparatively inexpensive to manufacture. They are used as tiny “button” batteries in hearing aids and as larger models in cameras. As long as they are kept sealed from air, zinc-air batteries have a long shelf-life; but once opened they will self-discharge quickly, and are intended to be used within a few weeks. Make sure that batteries are stored safely away from small children. Toys or other devices that contain button batteries should not easily release them. Tape battery compartments closed with strong tape to ensure they don’t pop open, and when buying new products that use button batteries, choose those with a locked compartment requiring a screwdriver to open. Rechargeable (or secondary) batteries can be re-used many times. This is because the chemical reactions that take place in the battery can be reversed by applying electric current. This reversibility isn’t infinite, though; gradually they lose their ability to be recharged as their active components dissipate and corrosion builds up inside. Like disposable batteries, they come in a wide variety of sizes. They’re sold in an uncharged state and must be charged before use. Make sure the charger you’re using is the one recommended by the manufacturer. Using the wrong charger can cause a battery to leak, rupture, or even ignite or explode. The lead-acid battery is the oldest form of rechargeable battery. It basically consists of electrodes made of lead metal and lead oxide, in an electrolyte solution of sulfuric acid; various other chemicals are added to retard corrosion and improve battery life. Not surprisingly, lead-acid batteries are both bulky and heavy, and have a low energy to volume ratio and energy to weight ratio. But they can supply powerful surges of current and are inexpensive to manufacture. You probably already know they’re commonly used in cars, as well as in boats, motorcycles, and lawn mowers. All that lead—the automotive industry uses over a million metric tons a year to manufacture automotive batteries—is a serious environmental concern, and research is ongoing in an effort to find alternatives to the lead-acid battery. However, one bright spot is the success in recycling car batteries: over 97% of the lead is recovered, one of the most successful recycling programs in the world. The nickel-cadmium battery uses nickel and cadmium as electrodes. It’s inexpensive, and is used in a wide array of applications, including laptop computers, cordless and cell phones, and digital cameras. But it suffers from the “memory effect”—if not fully discharged before recharging, it can lose capacity. On the other hand, it can withstand deep discharges without damage or loss of capacity, and works well in high-drain applications such as cordless power tools and cameras. Cadmium is toxic, and the Ni-Cd battery has largely been replaced by the nickel-metal hydride battery. Reasons include environmental concerns (it’s now all but banned in Europe) and because the latter has higher capacity and doesn’t suffer from memory effect. Ni-Cd batteries are still used in power tools and two-way radios. The nickel-metal hydride battery is a variant of the nickel-cadmium, replacing the cadmium electrode with an alloy. It, too, is inexpensive and is used in many of the same applications. The lithium-ion battery has a complex composition, but basically consists of a carbon electrode and one made of a lithium compound, with an electrolyte consisting of a lithium salt in an organic solvent. It has an excellent energy to weight ratio, a low rate of self-discharge, and no memory effect. Li-ion batteries are one of the most popular varieties used in portable electronics, and research is continuing to yield improvements in durability, cost, and energy density. There’s no single answer to this question. It all depends on the device you’re powering, and the kind of use it will get. On the other hand, “rechargeable batteries aren’t necessary for low-cost products that don’t use much power. For example, television remote controls can sometimes last for years on a single-use battery, so it doesn’t make sense to purchase more expensive rechargeable batteries for such a low maintenance device,” added Smith. And it’s a good idea to use disposable batteries in smoke detectors. Rechargeables self-discharge more quickly, which means you’d have to remember to change them more frequently—you certainly don’t want to risk a dead battery in a smoke detector. Batteries eventually reach the end of their useful lifespan whether single-use or rechargeable. But don’t just toss them in the trash; most batteries contain heavy metals such as mercury, zinc, lead, and cadmium—substances certainly familiar to you after reading this publication!—that can pollute the air and water if they’re not properly disposed of. And in fact, state and federal regulations affect how these toxic components are handled in the waste stream. The U.S. Congress passed the Mercury-Containing and Rechargeable Battery Act in 1996 to make it easier for rechargeable battery and product manufacturers to collect and recycle rechargeable batteries. As a result, their heavy metal content makes batteries good candidates for recycling, enabling reuse of these valuable materials and preventing pollution. The first step is to check with your local government’s waste disposal department; your municipality may already have a battery-recycling program in place as part of its Household Hazardous Waste (HHW) handling scheme. If so, the staff will give you instructions on how to package the batteries and what to do with them. Which brings up the obvious question: exactly how are batteries recycled? Alkaline batteries can be processed to recover steel and zinc; the steel is made into rebar. Nickel-cadmium and nickel-metal hydride batteries are heated, which separates the metals in the battery according to their melting points. Zinc and cadmium melt at comparatively low temperatures while nickel and iron melt at high temperatures. Some of the metals solidify when they cool; others are reprocessed as metal oxides. 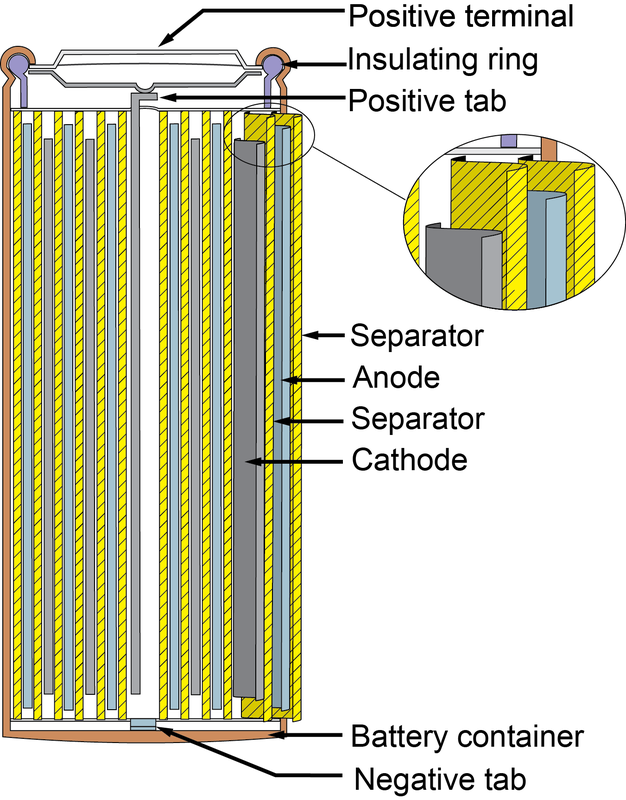 Lithium-ion batteries are processed this way as well. Silver oxide “button” batteries are shredded to recover their heavy metal content. Lead-acid batteries are recycled by grinding; the acid is neutralized and the plastic casings separated from the lead. All the components can be used in a variety of applications, including manufacturing new batteries. There are intriguing new developments in batteries, both in internal structure to increase safety and efficiency, and in new products being developed for market. In the former category, one of the major headaches in lithium-ion batteries is the problem of dendrites. Dendrites are fern-like crystals that form inside batteries and can cause short circuits, leading to overheating and even fires. One company has developed an extremely thin Kevlar separator membrane that prevents the growth of dendrites, yet allows unimpeded flow of ions. This has the potential to either shrink battery size without loss of energy capacity, or endow a battery of the same size with greater capacity. Another company is developing a “near anodeless” battery—one with an ultrathin anode of lithium metal to reduce battery size. In the past this has led to problems of dendrite formation—with associated short circuits and heating—and short battery life, because of the way lithium metal reacts with the electrolyte solution. To overcome these issues, this battery has both a solid electrolyte, and a non-flammable liquid electrolyte containing additives to prevent dendrite formation. The resulting battery can be recharged 300 times while retaining 80% of its original storage capacity, in a far smaller package than current batteries. Batteries for home use may soon include batteries to power the entire home. One company recently announced a “whole-house” battery, designed to store energy from a home’s roof-top solar installation. Since peak home energy use is in the morning and evening, and peak solar energy occurs during the day, this battery makes power available to the household when actually needed. There are larger implications in such residential power storage than just being able to charge your electric vehicle at night. Batteries like this could also supply power to the electrical grid when needed, smoothing out fluctuations between supply and demand. The ability to store energy from renewable but intermittent sources such as wind and solar is an important component in the development of a more robust, efficient and decentralized power grid. Rechargeable batteries for electronic, automotive or large energy storage facilities are currently being advanced by faculty and collaborators with the Florida Energy Systems Consortium (FESC) for economics, longevity and environmental safety. Current areas of interest include enhancing the capacity of the positive and negative electrodes, increasing the voltage of the positive electrode, improving solid state electrolytes, and minimizing the separator membrane thickness. Furthermore, focus is given towards faster charging and discharging rates as well as increasing the number of cycles. This work is done via experiment and simulation using computer based modeling. Dr. Andrei, from the Department of Electrical and Computer Engineering, Florida State University, advances batteries by modeling and simulation of energy storage devices. His specialty is the modeling, simulation, and computer aided design of Lithium-based batteries. He has developed RandFlux©, one of the most comprehensive software programs for the simulation and design of Li-air and Li-ion batteries. Currently, Dr. Andrei is involved in the design of Li-based batteries with high energy and power densities. Dr. K. Jones, from the Department of Materials Science, University of Florida, is currently working with Planar Energy to develop a solid state battery using a novel water based deposition process. The goal is to manufacture inexpensive safe high capacity batteries for electric vehicle applications. They also have a project working with Sandia National Laboratories to develop germanium nanowire electrodes for solid state battery anodes. Again the goal is improve the battery capacity and cycle lifetime through better engineering of the electrodes. Dr. D. Wei, from the Department of Chemistry, University of Florida, studies mesoporous carbon hybrid nanomaterials for high capacity lithium-ion batteries. Dr. P. Choi, from the Florida Solar Energy Center, University of Central Florida, focuses on the characterization and analysis of separators and solid electrolytes for secondary batteries. 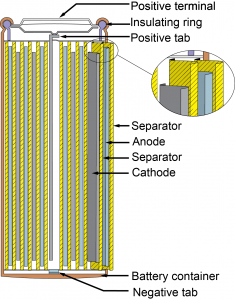 The separators play an important role in the batteries; they prevent electrical short circuit, while transferring ionic charge carriers. Glass and glass-ceramic electrolytes are also being investigated for all-solid-state thin film batteries with high capacity and improved safety. Dr. Sigmund, from the Department of Materials Science, University of Florida, studies novel materials for separators and novel ions for batteries (magnesium ion battery, vanadium redox flow battery). Don’t overcharge your rechargeables. Many devices with lithium-ion batteries will automatically stop charging once the battery is completely charged. But it’s still a good idea to avoid keeping the battery plugged in well past the “full” point; this helps avoid stressing the battery needlessly. Don’t undercharge them, either. Don’t let your rechargeable battery run down all the way to zero if you can help it; ideally you want your battery to be charged somewhere between 20 and 80 percent. If storing a rechargeable, first charge it to about 40 percent. Because rechargeable batteries lose power even when not in use, this will help to keep your battery from running down to a dangerously low level. Put your device on standby. If you’re not using your Bluetooth headset with your smartphone, turn it off. Otherwise, your phone will continually search for a headset, using power needlessly. Similarly, if you’re in an area without a Wi-Fi hotspot, turn off that feature on your laptop. Applications are available to help monitor battery life and shut off various functions that needlessly drain battery power; search the Web using terms like “battery,” “monitor,” and “saver” along with the name of your particular portable device. Dim that display. Displays that are extra bright and always on demand a lot of battery power. Check your device settings: many have an Auto setting that will adjust the brightness of the display automatically depending on the ambient light. Otherwise, reduce the brightness manually. And while you’re adjusting settings, also change the screen shut-off time. Do you really need your device to wait 10 minutes after the last keystroke before shutting off? Maybe two minutes will suit your workflow just fine. “4 simple cell phone battery savers.” (2014, December). Consumer Reports. Battery Solutions: Battery Recycling – Cost-Effective and Safe Disposal. A company specializing in battery recycling solutions, offers simple-to-use prepaid mailers and accepts all types of batteries, both disposable and rechargeable. Accessed May 8, 2015. — iRecycle Kit. Information on recycling kits, what is accepted for recycling, and pricing information. Accessed May 21, 2015. Battery University. Basic to Advanced Battery Information from Battery University. A Web site that provides practical battery knowledge for engineers, educators, students and battery users. Accessed May 11, 2015. Call2Recycle. A free rechargeable battery and cell phone collection program, operated across the United States and Canada by the Rechargeable Battery Recycling Corporation (RBRC). Accessed May 21, 2015. — How Call2Recycle Recycles Rechargeable Batteries. Accessed May 21, 2015. Granger, T. “Recycling Mysteries: Batteries.” Earth911.com, April 27, 2009. Includes a search engine for finding battery (and more) recycling centers via address, zip code, city or state. Accessed May 21, 2015. Manjoo, F. (2009, October 30) Four essential tips for extending the battery life of your computer, cell phone, and every other gadget. Slate Magazine. Accessed May 22, 2015. National Capital Poison Center. Battery Ingestion Statistics. Accessed May 19, 2015. National Capital Poison Center. Safety Tips for Button Batteries. Accessed May 20, 2015. Taub, E. A. “Tricks to Keep Your Device’s Battery Going and Going”. New York Times, March 11, 2010. Accessed May 22, 2015. U.S. Environmental Protection Agency. Batteries – Common Wastes & Materials. Accessed May 21, 2015. Wikipedia. Entries on “Alkaline battery,” “Battery,” “Electrochemical cell,” “Lead-acid battery,” “Lithium-ion battery,” “Rechargeable battery,” “Zinc-carbon battery.” Accessed May 22, 2015. First published December 2010. Updated May 2015. Battery Ingestion Statistics, Table 1: Button Battery Ingestions Reported to the National Poison Data System, 1985-2014. National Capital Poison Center. “Safety Tips for Button Batteries.” National Capital Poison Center. “How Call2Recycle Recycles Rechargeable Batteries.” Call2Recycle. Moscaritolo, A. (2015, February 3). “Energizer Makes Battery…From Recycled Batteries.” PCMag.com. Wasserman, S. (2015, January 28). “Safer Li-Ion Batteries using Kevlar membranes.” Engineering.com. Bullis, K. (2015, February 2). “A Battery for Electronics That Lasts Twice as Long.” MIT Technology Review. Biship, B., & Dzieza, J. (2015, May 2). “Tesla Energy is Elon Musk’s battery system that can power homes, businesses, and the world.” TheVerge.com.